- Inspect all material for any damage and let your dealer know as soon as possible. - Make sure to have your client approve all pieces prior to installation. Use is acceptance, and no exceptions will be made. - Choose your trowel based on what is most appropriate for surrounding field tile, but as a guideline we suggest a 1/4” x 1/4” square notch for the wall and 1/4” x 3/8” for the floor. - For application of mesh-mounted murals and borders on vertical surfaces, use a high-quality non-sag adhesive. Note: It is sometimes helpful to tack a couple small finish nails through the mesh to hold until adhesive has dried (for waterproofed surfaces, fill nail holes with silicone prior to grouting). - For application of mesh-mounted murals and borders on horizontal surfaces, ridges in adhesive should be troweled flat to avoid excess thinset from bleeding into grout joints. Any high quality, polymer modified thinset adhesive is suitable. - Any application that includes glass “Puddles” or “Currents”, or will be grouted with a light color grout, should be installed with white thinset only, to avoid discoloration. Note: Large “Friends” in murals and borders are shipped loose (not mesh-mounted), and must be installed separately. These should be back-buttered prior to installation to ensure full coverage. - For installation of “Individual Friends”, back-butter all pieces; taking extra care with thinner, more fragile ones like the Mermaid and Flat Crab, as well as hollow-backed pieces like the Quahog Shell. IMPORTANT NOTE: Some of our “Friends”, incorporate “land bridges” (recessed, unglazed clay connecting glazed areas, included for strength). These can be seen on pieces such as the Crabs, Mermaid, Moose and others. THIS AREA IS MEANT TO BE COVERED WITH GROUT. Care needs to be taken to not remove too much grout from these areas when sponging. Grout will stick with no issues assuming it is mixed to proper consistency and is not “flooded” when sponging. - For borders and murals that include “Pebbles” or “Skipping Stones”, which are a natural stone material, a high quality “penetrating” stone sealer should be applied to the surface prior to grouting to aid in cleanup. - A Sanded or “Hybrid” Grout should be used on all mosaic borders and murals, never use an Unsanded Grout as the joint size is too large, which will result in shrinkage and cracking. See below for list of recommended grouts. - If using a Sanded Grout for any design that includes glass “Puddles” or “Currents”, take extra caution during application to avoid scratching the surface. A “Hybrid” grout, which is designed to work with a variety of materials and grout joint sizes, is highly recommended. - Due to the varying height and texture of our borders and murals, grouting will require extra time and care. Make sure to plan for extra time to adequately blend any low and high areas as well as extra cleanup time for sponging so as not to hide any detail. A thorough and detailed grouting job makes all the difference in the final result of a Wet Dog installation. It may be helpful to use a combination of a standard rubber margin float and a softer polyproxylene float. - Do not try to remove all grout haze with just one or two passes of the sponge. Grout needs a chance to set-up properly before final cleanup can be performed. Note: A toothbrush is a helpful tool for cleaning excess grout from detailed areas that a sponge cannot reach. It may also be helpful to use painter's tape to mask off more textured pieces where grout can easily be trapped. - All borders and murals that integrate “Pebbles” or “Skipping Stones” should be sealed a second time after grout is applied and cured to protect from staining. Most grouts require a sealer to be applied anyway, so the full surface may be sealed at this stage. Any high quality “penetrating” stone sealer is suitable. * These are usually described as a “polymer-modified, color-consistant, non-shrinking, efflorescence-free grout. * Please note that these are also fast-setting grouts, so only mix up enough to work with small areas at a time. 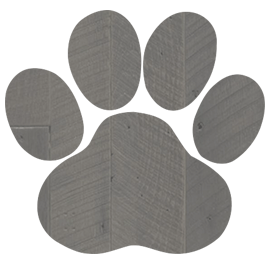 Click on the paw to download a PDF version of the instructions!